Cisco WebEx is a flexible conferencing solution designed for businesses of any sizes. 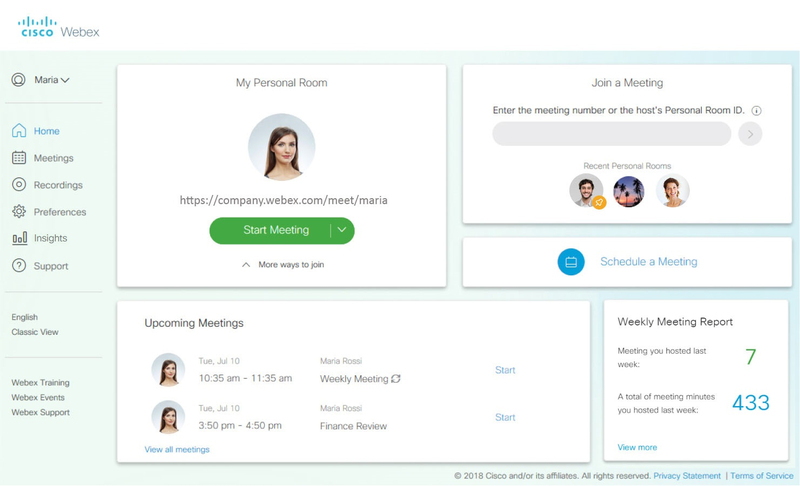 It is a video and audio web conferencing software, which integrates main tools, enabling the users to conduct meeting in the web using voice, video and related data. Cisco WebEx is readily available in different plans that users can select. Each plan caters specific work and meeting space capacity and is capable of holding multiple meetings in real-time. Apart from that, this software is also beneficial for big events like educational sessions and product launchings. Users can establish a team workspace that could promote effective brainstorming and group collaboration using the software’s broadcast-quality sound, teleconferencing system, and conference calls. Lastly, Cisco WebEx is also defined as a stable meeting and work platform with different productivity tools. This feature makes it easy to start, schedule, and conduct a meeting online. To begin the meeting, the users need to have a hosting account as a presenter in hosted meetings. In scheduling, users can prepare the invitation to the meeting using Microsoft Outlook and the scheduled conference will load on the software’s system. They only need to click the “Add WebEx Meeting” tab found on Microsoft Outlook. Inviting attendees in Cisco WebEx is made even simpler as well. You only need to have your attendees’ email address and invite them so they can join using their video system, computer or smartphone. Users are even allowed to change device while the online conference is going on. WebEx Meeting Center is basically created to facilitate the attendees to acquire seamless access to meetings and become active participants. Here is where maximum collaboration is amplified. This feature sets up the screen view automatically, depending on the type of files used. For example, if the file is a PowerPoint Presentation, the screen will display slide presentations and if it’s a video file, the screen will show a video presentation automatically, but all will work with the help of control features. Your attendees can even edit the shared files once they are given roles to provide comments about the files in real-time. Ideally, Training Center allows all attendees to improve brainstorming about the given topics in a live conference. Event Center is a feature of Cisco WebEx that gives liberty to the users to hold a meeting with up to 3,000 attendees. One popular component of the Training Center is that invitations and registration sites can be customized. Also, the events can be held interactively since Cisco WebEx accommodates chat, screen sharing, polling, and Q& A. The users are even given a chance to promote their branding to a large audience.